My favorite way to eat eggs is soft boiled with a runny yolk and a piece of toast to dip or mixed with a side of grits; it is part of my southern upbringing I suppose. Hard boiled eggs can be equally tasty sliced in a salad. Getting the eggs to the perfect stage and out of its shell though is the dilemma. My boss once asked me how to boil eggs. It took a moment to remember because boiling eggs was second nature; put them in a pot, cover with water, boil, steam, cold bath. Time…shime… I never kept track I just did it. Thankfully my advice panned out. Once a month on Dazzledish we try to post a ‘how to’ tutorial on a particular food, gadget or cooking tip because we want everyone to learn the basics so they feel confident in the kitchen. This month we will learn the art of hard boiled eggs and a few recipes to use them in. Place the eggs in a single layer in a large pot. Fill the pot with cold water to 1-inch above the eggs. Bring the water just to a boil on medium-high heat. Remove from heat, cover and steam for recommended time (see below). Immediately drain the hot water from the pot. Carefully cover the eggs with ice and cool water. A soft cooked egg has a firm white and runny yolk. Heat large eggs 1 1/2 – 3 minutes. Soft cooked eggs are mostly served in an egg cup small end down. The top is removed to expose the runny yolk. 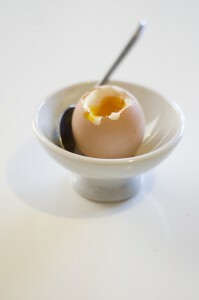 The egg is eaten out of the shell using a small spoon. You can also use strips of toast to scoop up the yolk. Medium cooked eggs have a firm white and a slightly firm yolk. Heat large eggs 4 – 6 minutes. Pair peeled medium cooked eggs with poached asparagus or toast or in a Kedgeree. 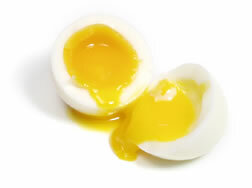 Hard cooked eggs have both a firm white and yolk. Heat large eggs 10 – 12 minutes or as long as 17 minutes. Eat hard boiled eggs with a sprinkle of salt or try some of the international recipes listed below. — Some individuals like to add salt or vinegar. They say it makes removing the shell easier. Add a splash of vinegar and a pinch of salt to your water. — Use eggs that are at least a few days old. Farm fresh eggs do not peel as easy. — Do not boil eggs with cracks. They will break open and leak. — Putting too much water in the pot will take longer to heat which can throw off the timing. Too little water will result in undercooked eggs. — Watch the water. At the first sign the water is boiling remove the pot from the heat. Keep time from the moment you remove the pot from the heat and cover it. — The ice bath stops the cooking process and the steam created inside the eggs will make it easier to peel. — To peel start at the larger end where the air pocket is. Grab hold of the membrane under the shell and peel off. — Chilled eggs are easier to slice. Warmer eggs are easier to crumble. 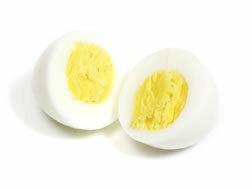 — Refrigerate unpeeled boiled eggs within a few hours for up to one week. — The times listed may vary slightly due to the way your stove heats, the type and size of pot you use, the amount of water and number of eggs. I made this cake for my mother-n-law a few years ago on her birthday. I am not a huge fan of potent orange flavor but this cake won me over. I decorated it with edible flowers but you could also use orange slices or flowers made out of pineapple. Cake flour is an essential ingredient as with any cake recipe. Cake flour does not have as much gluten which results in a lighter fluffier tender cake. I prefer to make my own using corn starch and all-purpose flour. 1 cup of cake flour = 2 tablespoons corn starch + 3/4 cups all-purpose. This cake is best eaten the same day it is made. Preheat oven to 350. Coat 2 (9-inch) round cake pans with cooking spray, line bottoms of the pans with wax paper. Combine flour, baking soda and salt stirring with a whisk. Beat butter in a large bowl on medium speed until light and fluffy, about 2 minutes. Gradually add 1 3/4 cups sugar, one tablespoon at a time, beating until well blended. Beat in orange rind and vanilla. Add egg whites, one at a time, beating well after each addition. Combine buttermilk and milk. Add flour mixture and buttermilk mixture alternately to butter mixture, beginning and ending with the flour mixture. Pour batter into prepared pans, sharply tap pans once on counter to remove air bubbles. Bake 25 minutes or until a wooden pick inserted in center comes out clean. Cool in pans 20 minutes on a wire rack, remove from pans, cool completely on wire rack. Combine orange juice and 1/4 cup sugar, stirring until the sugar dissolves. Pierce the cake layers liberally with a wooden toothpick. Slowly drizzle juice mixture over cake layers. Carefully place 1 layer on a plate, spread with 1/3 cup marmalade. Top with remaining layer, spread remaining marmalade on top of cake. Fold sour cream into whipped topping, spread over sides of cake. Cover and chill at least 2 hours.